Virsyn's Matrix Vocoder is one of the first plug-ins to use Steinberg's new VST3 specification. So if you want that classic vocoder sound, should you take the blue pill or the red one? 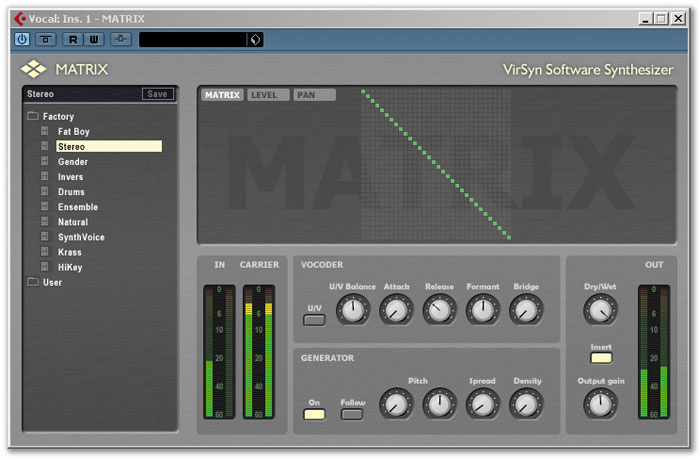 A recent addition to the Virsyn product line is Matrix, a vocoder plug-in that is available in all popular formats for both Mac and PC. While Matrix is relatively new, it has already reached version 1.1.1 and, in this release, becomes one of the first plug-ins to support Steinberg's new VST3 technology. Traditionally, vocoders provide a means of applying the spectral characteristics of one sound (usually termed the modulator) to another sound (termed the carrier — see Gordon Reid's 'Synth Secrets' article from the July 2000 issue of SOS for a detailed explanation of vocoding). The carrier determines the basic tonal character of the sound, but the amplitude and frequency content is modified by the modulator. Many vocoders, Matrix included, also include their own synthesis engine (termed the Generator in Matrix) to generate the carrier, and this internal carrier can usually be controlled, via a MIDI keyboard, to pitch the output. When it comes to applications, perhaps the most common modulator is provided by a vocal source, while the carrier might typically be a synth sound or other instrument such as a guitar — and the robotic or synthetic vocal sounds created can vary from the joke record cliché to the dance-track hit. So is the output from Matrix novelty naffness or Daft Punk cool? Matrix performs a spectral analysis of the modulator signal using a 32-channel filter bank and identifies the spectral energy in each channel. The signal is also analysed to detect the voiced (with a distinct pitch) and unvoiced elements of the modulator input. At the output end, the analysis of the modulator input is applied, via a synthesis filter bank, to the carrier signal. The supplied PDF documentation indicates that the software uses very precise analogue modelling eight-pole filters, extremely fast envelope followers and high-quality algorithms for the detection of the voiced/unvoiced elements and pitch extraction. A white-noise generator is also included for the processing of unvoiced phonemes. Technical details aside, the processing also has to be efficient to allow real-time, low-latency performance. 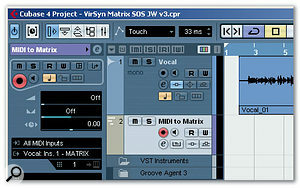 While Matrix supports VST2.4, for Cubase users who have upgraded to v.4.1.2 a VST3 version of Matrix is also supplied. This allows an audio or instrument track to be used as a carrier signal via Matrix's side-chain input. While the side-chain input could be used with earlier versions of Cubase (via various workarounds) and with other hosts such as Logic or Pro Tools, for Cubase users this whole process is much easier under version 4.1.2. Matrix version 1.1.1 also includes polyphonic support. The Level screen allows the overall frequency balance of the output to be adjusted. Some stereo interest can be added via the Pan screen.I was supplied with Matrix as a 16MB download and the installation process proceeded without a hitch. Copy protection is provided via a Syncrosoft Key (not supplied but available for about £12 via the Virsyn online store). Matrix runs as a fully functional demo for 10 days without copy protection. The Matrix user interface is split into three main sections. To the left is the Browser, where the user can select from the fairly modest selection of factory presets or from their own user creations. The top-right area can be toggled between three functions: Matrix, Level and Pan. The first of these screens is what Matrix derives its name from, and controls how the 32 channels of the modulator analysis output are routed to the 32 channels of the synthesis filter stage. With the default setting — running diagonally from top left to bottom right — the frequency bands of the modulator analysis are matched to the same frequency band in the synthesis filter stage. While this generally produces the most natural result, the user can define any arrangement they wish and, for example, a diagonal running top right to bottom left would link the lowest frequency bands on the modulator signal to the highest frequency bands in the synthesis output stage. The Level and Pan screens are fairly self-explanatory. Both offer individual control over each of the 32 filter bands. The Pan screen allows you to create a sense of space in the sound by spreading different filter bands across the stereo image. In the bottom right of the interface, the Input and Carrier meters show the levels of the modulator input (the audio track into which Matrix is inserted) and the carrier input respectively. For the Carrier meter, the levels either reflect an audio source arriving via the side-chain input, or the presence of MIDI data when using Matrix's internal generator as the carrier signal. 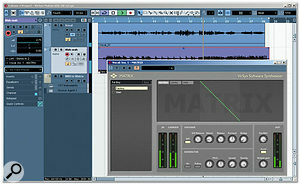 Matrix would usually be placed as an insert effect on an audio track, and only the processed signal is usually required. However, the Dry/Wet control allows the unprocessed modulator signal to be mixed with the vocoded signal for extra flexibility. According to the PDF manual, the Insert button is supposed to defeat the Dry/Wet setting, giving a 100 percent wet sound. However, in my testing within Cubase 4.1.2, the button had no effect and the Dry/Wet button had to be set fully clockwise if I wanted to hear only the wet, processed signal — a minor quirk. Within the Vocoder section, the U/V switch controls how unvoiced phonemes (sounds that contain little pitch information, such as 'F'- or 'S'-based sounds) within the modulator signal are processed. When U/V is switched on, the internal white-noise generator is used to process unvoiced phonemes; when it's switched off, the carrier signal is used. The U/V Balance control adjusts the balance between the voiced and unvoiced elements of the input signal, and when you're using a vocal as the modulator this balance has a dramatic effect upon the intelligibility of the voice, with lower settings giving clearer pronunciation. In very simple terms, the Attack and Release controls can be thought of as similar to controls on a synth ASDR envelope. Higher or lower settings of either control tend to reduce the intelligibility of the vocal. In between the extremes, however, there is plenty of scope to create quite clipped, precise diction or smoother (if less clear) pronunciation. In this example, Matrix is inserted on the Vocal track. With the side-chain input activated (the orange button), the plug-in is using the wah-wah guitar track as an external carrier signal. This track has its output routed to Matrix in the Project window Inspector.The Formant control can be used to pitch-shift the formant element of the output, generating anything from slight gender shifts through to the usual Barry White or chipmunk effects, only with a vocoded, robotic edge. The rather oddly named Bridge control allows the carrier signal to be blended into the processed output. If the carrier is an external audio source (for example, a synth sound), this can add some interesting possibilities, but the Bridge control is best left at zero (fully anticlockwise) when you're using the internal carrier, as its unprocessed output is not particularly pleasing to the ear! The control set is completed by the Generator section. The On button engages the internal generator, while the Follow button dictates how Matrix pitches its output. With Follow off, the pitch is determined by the MIDI note events. Otherwise, with Follow switched on, the pitch variations of the modulator input are followed. The two Pitch controls, coarse and fine, provide an offset relative to the tracked pitch. Density controls how many of Matrix's 16 pulse generators are used (higher values give a denser sound) while the Spread control detunes the oscillators, to further thicken the sound. Low values work best here, and I found anything beyond about five percent for Spread resulted in the MIDI pitch information becoming lost in the output. Mac: G4 1.6GHz or faster, 512MB RAM, Mac OS 10.4 or higher, 20MB hard disk space, VST2.4/RTAS/AU compatible host sequencer. PC: Pentium III/IV, Althon 1.6GHz or higher, 512MB RAM, Windows XP, 20MB hard disk space, VST2.4/VST3/RTAS compatible host sequencer. Setting up Matrix within Cubase 4.1.2 proved very straightforward. The plug-in is simply placed as an insert effect on the track to be used as the modulator input. If you're using the internal generator as the carrier input, it is simply a case of creating a suitable MIDI track and directing its output to Matrix. This can be done via the Output Routing panel either within the Project window Inspector or the Mixer window. To use a second audio signal as the carrier, the side-chain input needs to be activated and Matrix can then be set as the output destination for the audio or VSTi track that is to be used as a carrier. Once configured with a vocal track as the modulator, Matrix is certainly capable of producing all the usual vocoder treatments. For typical (clichéd?) robot voices, the internal generator as carrier and MIDI note control do an excellent job. The combination of the various Vocoder and Generator controls provides plenty of flexibility in terms of the final output, whether you are looking for a simple spoken robotic voice or a synthetic sung vocal. For the latter, the new polyphonic capability is very useful, as harmonies played via the MIDI keyboard can be generated in real-time. The ability to pan the various filter bands also provides a useful extra dimension to the sound. When you're using the internal generator as the carrier signal, MIDI note data can be routed to Matrix to control the output pitch.The side-chain input for an external carrier clearly offers further creative potential. Used with a vocal-based modulator, this is reasonably easy to use and obtain useful results from, but it is a more complex task than simply using the internal generator. It therefore requires a willingness to experiment, as it can be difficult to predict just how a particular modulator and carrier pairing are going to interact. That said, I got some really interesting (and, it has to be said, downright weird) outputs by using various types of guitar part (including a wah-wah performance) as a carrier. Of course, vocoders are not restricted to the use of vocal tracks as modulators; instrument parts can also be used. Again, this can be simple enough to deal with if you're using the internal generator but add in a second audio source via the side-chain and things can become considerably more 'experimental'. Trial and error is pretty much the name of the game here — weird is easy to do, while wonderful can be a bit more elusive but is certainly possible. Vocoding is quite a specialist type of effect and, given that some (many?) may put it into the novelty bracket, the asking price may seem a little steep for a single plug-in. It is, therefore, perhaps difficult to describe Matrix as a bargain, but if a vocoder is something you like to have to hand, Matrix is certainly a well-specified plug-in. Used with the internal generator and MIDI control it offers plenty of options for shaping the sound created by the processing. Using a side-chain input and an audio carrier signal does take some experimentation, but there are plenty of creative possibilities for those prepared to invest the time. For Cubase-using vocoder fans, Matrix is certainly up there, in terms of sound and functionality, with some of the obvious plug-in competitors. For those interested in experiencing the potential before deciding whether to abuse their credit cards, the fully functional demo is well worth a test drive. As a quick web search will reveal, there are a number of freeware and shareware vocoder plug-ins available, and some mainstream sequencers include a vocoder in their bundled plug-in collection (for example, Logic's EVOC20, as explored by Stephen Bennett in the March 2007 issue of SOS). However, perhaps the most obvious competitor to Matrix is the Eiosis ELS Vocoder (www.eiosis.com). Slightly cheaper, but also very well specified and, for hosts that support it, also including side-chain inputs, Prosoniq's Orange Vocoder — still going strong in its 10th Anniversary Edition — is also a well-established alternative, although Cubase users might note that it does not, as yet, support the VST3 standard. Easy support for external audio carrier in Cubase 4.1.2. Great for classic vocoded vocals. May seem expensive to some if only for occasional use. Some very minor quirks during testing. 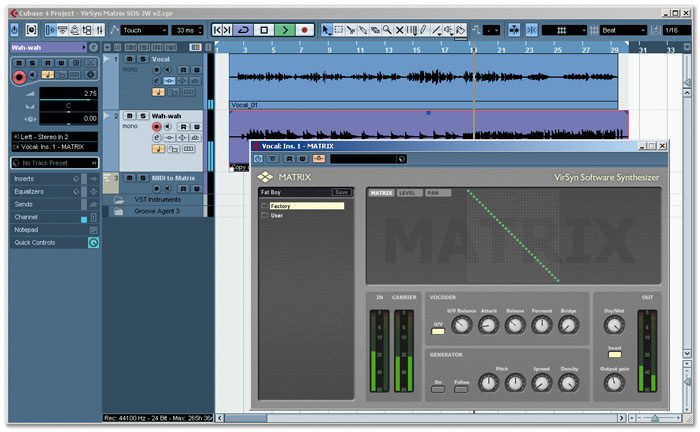 If you need a well-specified vocoder, Matrix is worth auditioning — and the VST3 support will give it considerable appeal for Cubase users. 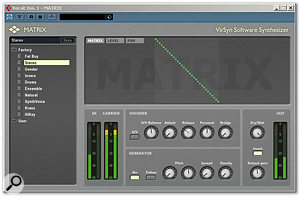 Virsyn Matrix 199 Euros (download price including VAT).